Denver played host to the first presidential debate of 2012, but for TV viewers in the Rocky Mountain State, the political mudslinging has been going on for months, thanks in large part to the deluge of political ads from Super PACs and other third-party groups. Since Aug. 1, these groups have joined with the official campaigns to buy time to air more than 26,000 political ads on the city's ABC, CBS, Fox and NBS affiliates. The onslaught is wearing down many locals. "I have reduced drastically the amount of television I watch," Denver resident Larry Bahn said. "I have just about given up watching local news because the ads are almost continuous there." But they've fallen far short of what's needed. And it's possible that the Denver affiliates, along with other stations around the country, may be liable under laws that forbid false or deceptive advertising over the airwaves. In Free Press' report, Money, News and Deception in Denver, I investigated local coverage about the five groups that are spending the most in Denver: the Republican-leaning American Crossroads/Crossroads GPS, Americans for Prosperity and Restore Our Future, and the Democratic-leaning House Majority PAC and Priorities USA Action. Since August, these groups have signed contracts with Denver's affiliates to air 4,954 ads in the local market, paying more than $6.5 million to secure the spots. And yet Denver's ABC, CBS and NBC affiliates devoted only 10 minutes and 45 seconds to fact-checking ads from these groups. The local Fox affiliate spent no time whatsoever examining these ads. All told, that's a ratio of one minute of news for every 162 minutes of political ads. On Sept. 11, KCNC CBS4 News political specialist Shaun Boyd labeled as "false" an ad by the Koch-funded group Americans for Prosperity. The spot compared President Obama's health-care reforms to the Canadian system. Boyd found this comparison misleading: "They are playing fast and loose with the facts to play on voter fears," she said. By the time Boyd's segment had aired, Americans for Prosperity had spent $1,384,400 to place more than 700 ads on Denver's ABC, CBS, Fox and NBC affiliates, including 209 ads on KCNC. Here's the catch. Local television stations are legally required to air federal candidates' ads, whether they're accurate or not. However, this requirement does not apply to ads from "non-candidate" groups like the Super PACs and tax-exempt 501(c)(4)s like Americans for Prosperity. When it comes to ads from non-candidate groups, stations are allowed to reject inaccurate ads in the same way that they're allowed to reject consumer product ads that make false claims. It's not entirely clear that stations can be held liable for knowingly airing false, misleading or deceptive advertising content in ads from third-party groups. Broadcast industry attorney Michael D. Berg writes that stations are in a "balancing act," trying to respond to the heightened demand for ad placements while remaining on the right side of the law. "The FCC has a long history of expecting stations, as part of their overall obligation to operate in the public interest, to avoid knowingly airing false claims in commercial advertising," Berg writes. "That principle spills over to political ads, at least by non-candidates when a station has been made aware of the alleged falsity." 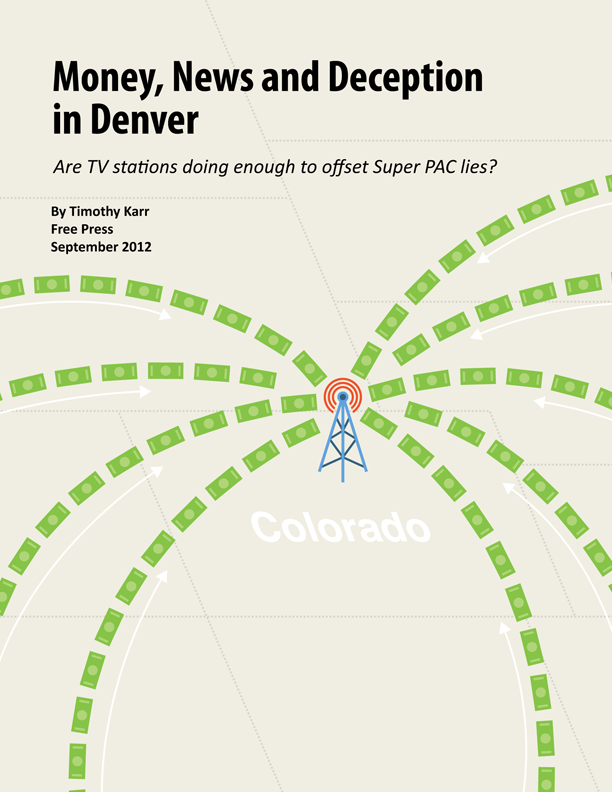 Denver stations have done better than those in other markets at probing the claims in political ads, but they've stopped far short of refusing ads from groups that mislead viewers. Stations that ignore these concerns and continue to profit from political lies should be held accountable to their viewers -- and the law.